Most documentaries about figures form cinema history are strangely boring, a lot of murmuring talk with clips to represent a medium that lives on its image engaging audience. That's why I was excited to see the Mark Cousins was helming this study of Orson Welles. Cousins, who made the mesmerising Story of Film a few years back, knows how to make a talk fest engaging: making the talk essential to a parade of images both on point and peculiar. With a trove of Welles's own art from travel sketches, home made Christmas cards, film and stage production ideas, personal caricatures, and so much more, Cousins traces Welles's career by timelines as they loosely fit into chapters with the names of chess pieces, pawn, knight and king, and then a coda with a quote from Kenneth Tynan. As we see the development of the artist from his early travels, through his precocious radio and theatre production to Citizen Kane and beyond on film we are given Cousins' insights into the man and his art. From the grandeur of Kane's set pieces to the intimacy of his changing Santas on cards a Welles emerges that we might well have imagined but is here more fully realised than I've seen before. Cousins, of course, knows his cinema and his use of motif is astute, if sometimes imposing. We return persistently to the photo I've included here; a young man thinking, head resting in a hand, accepting the projection of whatever conceit the filmmaker using the image wants. It's a touchpoint and we see it variously in detail in full, reminding us that we are being presented with an image and an idea as Cousins' narration in the second person addresses Welles himself. 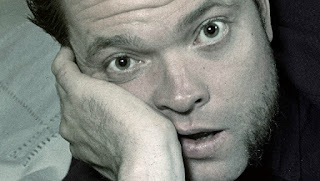 More than any figure in 20th century cinema, Welles demands a broader canvas in his biography or critical appreciation if only to emphasise that this flawed master of the form considered it only one of the things he did and wrote in the 1960s that he thought film was a "dying, dying art". Cousins is determined to show us the need for examining the Welleses of the world and bids us in his gentle Ulsterman lilt to explore for ourselves. So, if you see this one don't go getting the blu-ray of Citizen Kane until you go foraging for something old and forgotten (there are many starting points in this film) and something new and unknown. You are part of the art you witness. So, if you smoke have a cigar and if you drink have a sip of cognac. You are you're own movie and should seek the company of others. Screening notes: My first session at the Forum. It was packed at 1.30 pm on a week day! I sauntered in and my jaw dropped at the sight of the first two rows almost completely filled. I found a seat third from and had a fine old time. I like to exit left at the Forum as it allows a quick flyover of the lovely interior but even though the doors opened I was told by a teenaged vollie that they were um only letting people out the other door today. Miffed but philosophical I did as bade and filed out with the rest to the footpath on Russell where the wind was biting and the sky was grey. I got over my privation on the walk. There was a lot to ponder.